Rene Herse long produced a “démontable” model for travel. This design used quick releases on the top and down tubes to allow for easy disassembly. I know of three builders who can do a Rene Herse-style démontable: Toei, Wantanabe, and Mark Nobilette. If anyone knows of more, let me know. 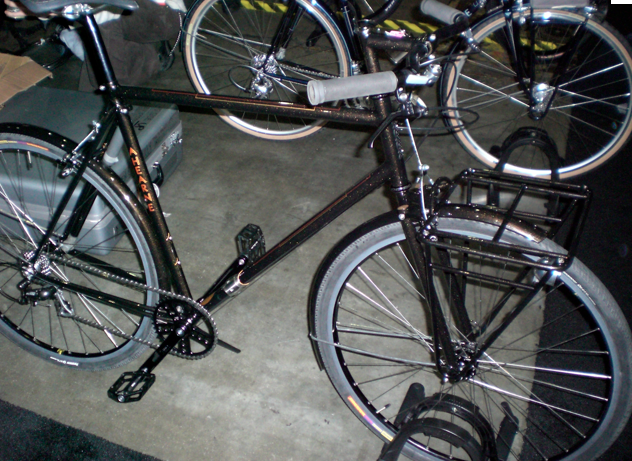 The Nobilette system was displayed at NAHBS, and A. Wetmore, among others, took several photos found here. I’ve seen the bike in person, with paint, as my friend Sky owns it. It comes apart in quite the cultivated manner. Cyclofiend Jim does a good job of explaining it here. I thought I’d compare a traditional 650B frame (MAP Rando Project) with a contemporary custom take-apart randonneuse (Nobilette). The seatstays hit a bit lower on the seat tube, and the seat cluster and bb are fillet brazed, but seems pretty similar in shape. I wonder if the demountable is stiffer. Its a nice option. Of course, as I discuss in this post from last year, traveling with a bicycle offers benefits and drawbacks. The idea of a take-apart frame means that you have your regular bike, set-up your way, ready for long and short rides. I’d use one for randonneuring and cyclotouring. For short city rides, on and off trains and buses, a folder might work better. Many folk considering a take-apart bike have flying in mind (the ability to sneak to bike through luggage check without an additional charge). But it is also handy if you’re touring and choosing to rent a car for the return trip. The ability to break the frame into two parts make it possible to rent a smaller, cheaper sub-compact car and load the bike in the trunk. I wasn’t aware Rene Herse made a take-apart bike. Beautiful bike! Jack – that’s an excellent point. I’m glad you mention it. Also, for those of us with more than one bike, a take-apart allows for easier out-of-sight storage to appease patient partners. 25 September 2010 - 3:24 pm Lovely Bicycle! That Rene Herse Demountable is amazing, my God! Thanks for this post; I have been curious about these bicycles – especially as I travel a great deal. It amuses me that people perceive the Ritchey system as being weak or of dubious merit, as if something designed by Tom Ritchey and sold by Ritchey Design could possibly be crap, or dangerous. I’ve ridden a Ritchey BreakAway for six years now and love it. I’ve traveled plenty by plane with it, but also use it as one of my main bikes. I’ve also rough-stuffed on it quite a bit. It’s bullet-proof. Ritchey also offers cross bikes with the BreakAway feature, they have offered a mountain bike version, and Tom himself rides a tandem with BreakAway couplings. All those get a lot of potential abuse, but the integrity is there. At Interbike last week, I literally heard a bike company owner describe the S&S couplings he offers on his bikes as “stronger than the tubes themselves.” Why would that be necessary, or a good thing? The Ritchey system is minimalist, but it gets the job done flawlessly without being overbuilt, ugly, or unnecessarily heavy. I agree – we trust bolts all the time. I’ve heard a lot of people split hairs about it. Everything can be over-analyized. The new color scheme on the Breakaway is pretty hot. On the Rollers to Bonsall 200k Matthew was riding one of those Ritchey frames. It does look pretty good. In fact, my local Performance (I know, I shouldn’t shop there) has a frame hanging up above the cashier. I’d consider it if I were traveling. However, I’d much prefer that MAP 650b frame. That was my favorite bike of the San Diego show. Not a folder, but I’d just have to deal with it. Fredformance was selling Breakaways for really cheap – I wonder if that’s a NOS model that would get out the door for a song. Yea, Mitch has got things just right – did you read the BQ review? Better than I expected, considering Mitch is so young. Velo Cult is doing custom 650B rando bikes from Mark Nobilette – you should email them and ask about it. Mine’s in the que. Yep, I read that review. I was glad to see how well received it was. Looks like a great bike. I know about your bike. I checked out the prototype at the SD show, and Sky said that you were getting the first one. I’ll wait to see what you think about it. I’m really liking the Kogswell, but there are some things I’d change. Some things that may be addressed by the MAP or the Velo Cult frame. If you ride a 54, Topanga Creek Bicycles has a Ritchey Breakaway hanging up. They are selling it for what seems like a good price. Panasonic makes a split-able touring frame. I discovered this after a week long test ride of a classic Panasonic Tour de Lux that I eventually bought from a friend. It’s one of my favorite all rounder bike.